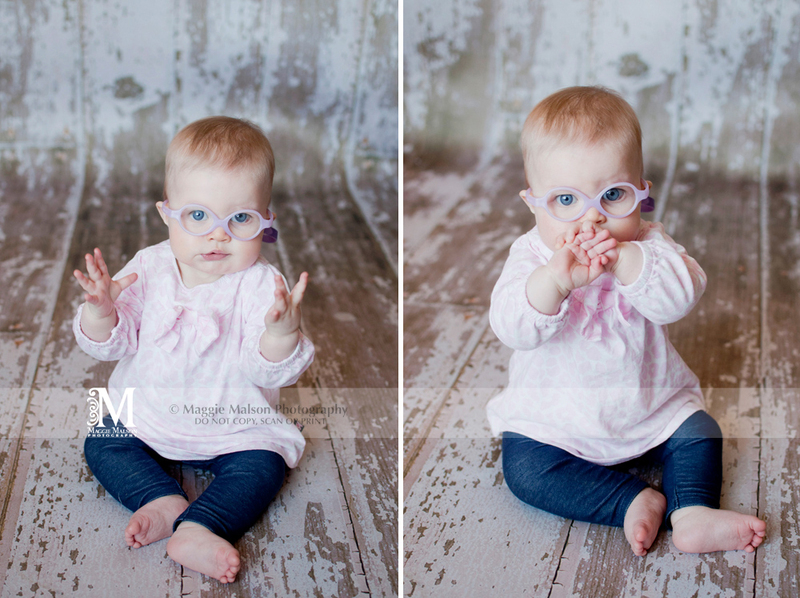 Until I had my last baby, I didn’t know the new recommendations that babies have their first eye exam at 6 months old. In fact, my oldest two didn’t have their eyes checked by an optometrist until they were 9 and 6, yikes! My oldest was starting to complain it was hard to see the board and after I’d made her appointment, I also received a note she should see an eye doctor after they did eye checks at the school. Little Man actually did see the opthalmologist at 2 months as I found a little spot in his eye where the iris juts into his pupil. It turned out to not be a big deal and something we just watch at his exams, but it was important to have it checked out. At Baby girl’s 4 month well-child check, I remember the pediatrician mentioning the recommendation and the kids’ optometrist also mentioned when I took them in last fall. So, it had been in the back of my mind to get it scheduled when Baby B turned 6 months old. And, fortunately, I didn’t wait. What I figured would simply be a routine exam with everything checking out perfectly actually did turn into an early intervention appointment as the doctor found a cataract on her left eye. She referred us to a specialist (who we actually had seen years before with our son). She confirmed the diagnosis and scheduled surgery for the following week to remove it. In addition to the cataract, she found her to have optic nerve hypoplasia, which means her optic nerve is smaller than normal. While it was disappointing to hear this, I believe God has a plan for our little girl and we are optimistic that despite this setback, she will still be able to gain vision in her eye with therapy and patching. We’ve had so many friends, family and even strangers praying for her, and we are so thankful to have a faithful community behind us. And while, this has been a testing of our faith, I have definitely seen God’s hand through it all. We feel very blessed. I know lots of clients and friends expecting or with small babies and children. I just want to pass on our experience in hopes that more little ones’ eyes can be checked early too. Some eye problems can be missed at well-baby checks, so it’s always good to take the additional steps. We are thankful her condition isn’t more serious, and her prognosis is good. Without early intervention, we may have been dealing with a different outcome. So, don’t wait! Get those little eyes examined soon. Please pass this information along, and share with friends and family too. 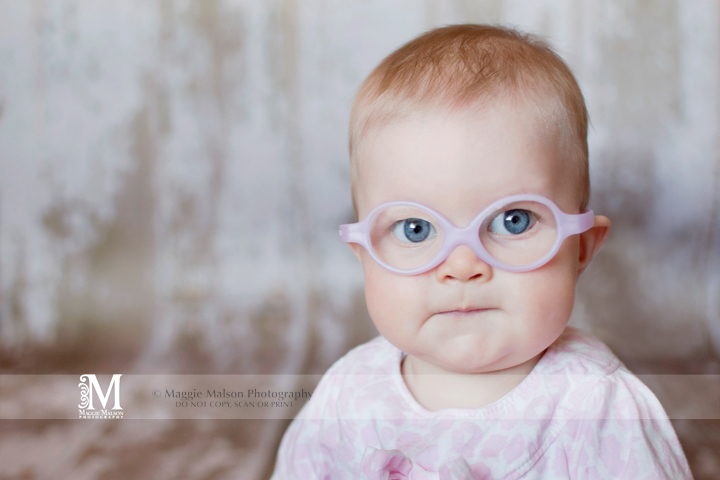 And here’s baby girl in her new specs. Pretty darn cute if you ask me. ;0) We do patch her other eye every day in order to help strengthen the one with the new lens. So far she’s tolerating well. We are very thankful!! Special thanks to Dr. Edmunds and the staff of Family Eye Center. They have been all our children’s eye care providers from the very beginning and we are thankful for the service they provide. You can contact Family Eye Center to find out more about the one-time, no cost eye and vision assessment for babies 6 to 12 months old. This entry was posted in Baby, Blogging, Essence, Getting Personal, Small Business Spotlight and tagged baby, Essence, getting personal | Bookmark the permalink. Such a sweetie! 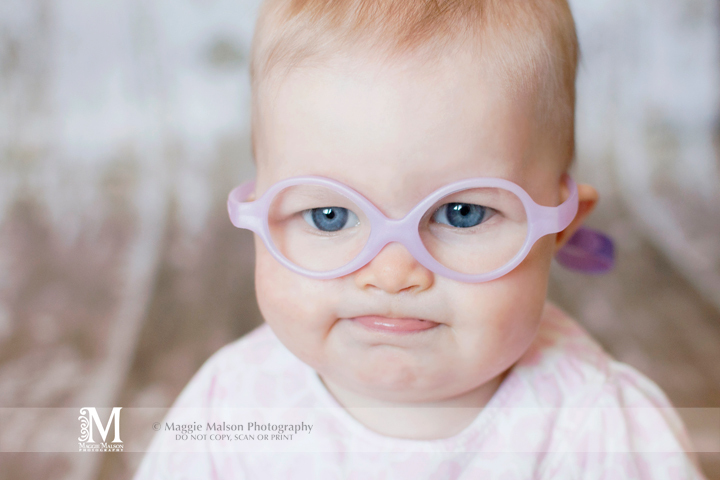 She is just adorable in her little purple specs!! Thanks for sharing your story, Maggie. I’m sure it will be of benefit to someone, someday. Will continue to pray for a complete healing of B’s eye. Hugs! Oh how adorable!!! This is great information, I would have never thought to get little ones eye exams that small. Thanks! 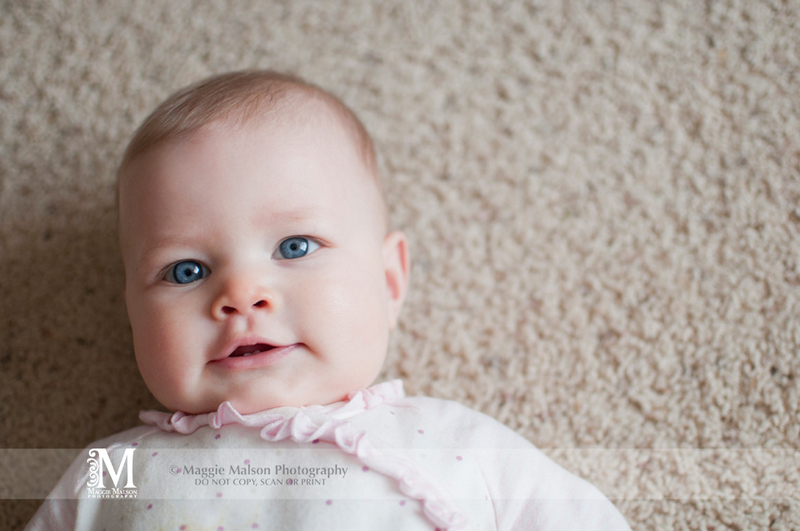 Aww, she has gorgeous blue eyes. Thanks for sharing your experience. Glad you caught it early during her development stage. She will be fine! I will pray for your family. Awww so sorry you have to go through this with your baby. Specs or no specs she is GORGEOUS! Adorable!! Just love her glasses.